Silvicultural contributions towards sustainable management and conservation of forest genetic resources in Southern Ecuador. Contribuciones silviculturales para manejo sostenible y conservacion de recursos geneticos forestales en el Sur del Ecuador. München, D - 85354 Freising - Weihenstephan, GERMANY , Tel. Bosques con una diversidad alta de árboles (por área) normalmente son caracterizados por una abundancia baja de muchas especies. Este hecho tiene implicaciones fuertes hacia un manejo sustentable de recursos genéticos forestales como también hacia la conservación. Después de la selección de especies prioritarias utilizando criterios ecológicos y económicos, se inició una evaluación de la variación genética dentro de cada especie prioritaria. Por ello se estudió la fenología de Cedrela montana, Prumnopitys montana, Myrica pubescens y Clethra revoluta durante por un plazo de dos años en dos sitios diferentes: ECSF (Valle de la Estacón Científica San Francisco) y "El Bosque"(cerca de San Pedro de Vilcabamba). Adicionalmente se realizaron inventarios forestales en la Reserva "Estación Científica San Francisco" y en la Reserva "La Ceiba" en el bosque seco. Los resultados demuestran una variación alta de datos de floración y fructificación, no solo entre las dos áreas geográficas, sino también dentro de ellas. Como consecuencia, esa variación se debe considerar en planes de manejo y conservación. Los inventarios demostraron que hay varias especies con subpopulaciones sin contacto o flujo de genes entre ellas o que son demasiado pequeñas para conservación estática de recursos genéticos. Para delinear zonas genecológicas (en la Provincia de Loja) para fuentes semilleros dentro de programas de manejo forestal sustentable como también para conservación de variación genética, los mapas existentes de condiciones ambientales en la Provincia de Loja fueron cruzados con SIG. Después de la identificación de las zonas genecologicas y sus superficies correspondientes se puede decidir si las superficies son suficientes para conservación en situ o si se debe realizar medidas adicionales como establecimiento de seed orchards, archivos clonales o amplificación de áreas protegidas. Forests with high tree species diversity (per area) are mostly characterized by a low abundance of the single species. This fact has strong implications on activities towards a sustainable management of forest genetic resources as well as towards their conservation. After selection of priority species using ecological and economical criteria, an assessment of the phenotypic and genetic variation within each priority species was started. For this purpose the phenology of Cedrela montana, Prumnopitys montana, Myrica pubescens, and Clethra revoluta was studied for a two-years period at two different sites: ECSF area (San Francisco valley) and "El Bosque" (close to San Pedro de Vilcabamba). In addition, forest inventories were carried out in the dry forest "La Ceiba" and at ECSF area. The results show a high variation in flowering dates and fructification intensity not only between the two geographical areas but also within. Consequently, this high variation must be considered in management as well as conservation activities. The inventories showed that there are several species with subpopulations that may have no contact between each other or might be too small even for static conservation purposes. To delineate genecological zones (i.e. provenance regions), which can act as seed sources for sustainable forest management programmes as well as for the conservation of forest genetic variation, the existing maps of environmental conditions in Loja and the vegetation cover were overlaid. After the identification of these zones and their size it can be decided if the areas will be sufficient for an "in situ" conservation and sustainable management or if additional measures have to be undertaken (e.g. establishment of seed orchards, clonal archives, amplification of conservation areas). The objectives of the conservation and sustainable management of forest genetic resources are to secure the ability of forest tree species to adapt to environmental changes and to maintain the basis for improving production and other benefits of growing trees (Graudal et al. 1997). This might be even more important if global change models become true. Conservation and sustainable use of forest genetic resources is a major issue in national and international policies (Young et al. 2000). New Forest Management is no longer focused on the maximization of profits from timber and non-wood forest products, but it is also concerned about sustaining the integrity of forest ecosystems. The strategies for conservation and the applied methodologies depend on the specific objectives and on the scope of the programme. There are two basic strategies for genetic conservation, the one is "in situ" (FAO et al. 2001), the other is "ex situ" conservation (FAO, IUFRO 2002). These two strategies are complementary. Because natural ecosystems are not static but dynamic, genetic conservation should not be restricted at promoting the maintenance of a given state (i.e. "static conservation") forever, but shall be directed at ensuring the adaptability of the ecosystem and the enhancement of the genetic diversity presently available to meet future requirements (i.e. "dynamic conservation" or "evolutionary conservation"). The establishment of forest plantations is not only an option to provide sustainable supply with timber and NWFPs and to minimize the pressure on natural forests but can also be an important complementary contribution to dynamic conservation. Before that background the continuous supply with high quality tree seeds or "forest reproductive material" of indigenous species is one of the fundamental challenges for sustainable forest management. The installation of a sound programme for managing tree seed resources on a national or regional level is a very first but nevertheless important step for the realization of successful tree planting activities. Hufford & Mazer (2003) point out that in general data are needed to delineate "seed transfer zones", or regions within which plants can be moved with little or no consequences for population fitness. This paper tries to address this problem for the Province of Loja, South Ecuador. Regional programmes must be embedded in the national framework for conservation and management of forest resources. However, we are not reflecting in detail about the goals and considerations of the National Forest Programme of Ecuador (NFP) and its political, socio-economic, financial and organisational aspects or about strategic considerations therein (for details see Graudal et al. 1997, Graudal 1998), but we will focus on some technical aspects within a regional framework. For instance: What can be the objectives of a regional Tree Seed Programme in the Loja Province? Long term objectives can be: (1) improved wood production and provision of other benefits from growing woody plants to help meet the regions' requirements for timber, poles, fuel, fodder, food, and shelter, (2) contribution to the rehabilitation of degraded environments (e.g. the reforestation of abandoned pastures), and (3) conservation of genetic resources of trees (Graudal 1998). The provision and promotion of suitable seed requires an organisational backbone including a functioning seed procurement technology (Graudal 1998). Suitable seed means the use and maintenance of defined and well-documented seed sources. In terms of environmental and genetic sustainability a preference should be given to native tree species and their provenances, which are well adapted to the specific site conditions. At the moment and as far as we know, no species specific conservation or management plans have been developed and implemented in Ecuador with the objective to protect these genetic resources for sustainable use in future. Within the project "Afforestation with Native Species of Abandoned Pastures of South Ecuador" of the German Research Programme (DFG) " Functionality in Tropical Mountain Rain Forest of South Ecuador" at the Estación Científica San Francisco we try to develop the scientific basis which can be seen as a contribution to the establishment of a "provincial tree seed and plantation programme" which can function as a complementary for the conservation of forest genetic resources. For technical implementation of the short-term objectives we suggest a stepwise approach (see Graudal et al. 1997). 3. Identification and delineation of genecological zones (tree seed zones, provenance regions) as a prerequisite for seed supply with adapted forest reproductive material. Overlay of existing maps about environmental conditions with maps of forest cover or vegetation. Box 1. Steps to the conservation and sustainable management of forest genetic resources in South Ecuador. Caja 1. Pasos para conservacion y manejo sostenible de recursos geneticos de los bosques del Sur de Ecuador. The investigation within our project tries to develop and provide basic scientific knowledge and methods for the implementation of some of the above-mentioned steps. 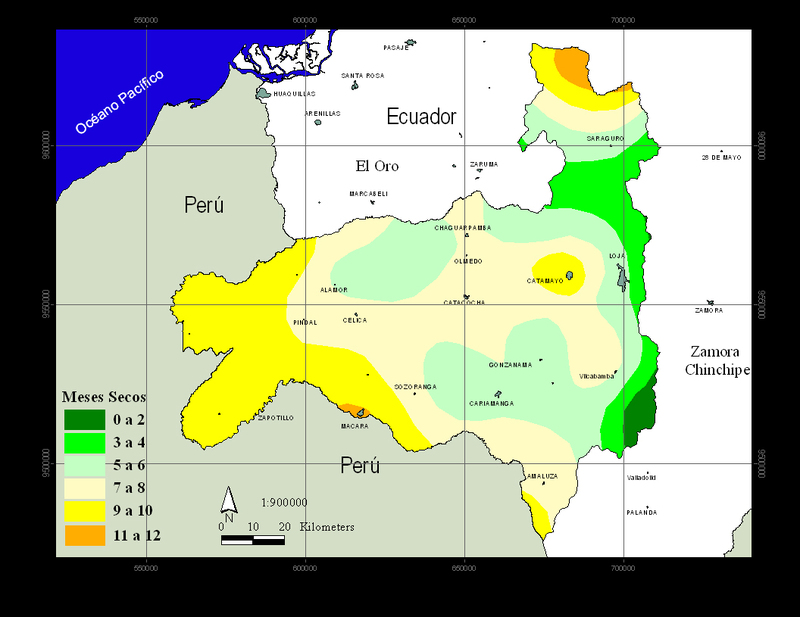 Phenological studies were carried out from 15 of June 2001 to 15 of June 2003 at San Francisco Station in the Province of Zamora Chinchipe, 30 km west from Loja and at El Bosque, approx. 10 km southwest from San Pedro de Vilcabamba, Loja. Both sites lie at an altitude of 2100 m a.s.l. in the evergreen montane rainforest zone. Five clustered individuals of similar phenotype (height, diameter, crown position and crown form, vitality) with distances less than 25 m between each other were selected of each species at one site. The selection criteria should guarantee a minimum of natural variation of ecological parameters and phenotype. Under this precondition we suppose that a variation in the observed phenological traits exhibits a very first and preliminary estimate of possible genetical variation between conspecifics rather than a result from differences in ecological conditions. Phenological data of flowering and fruiting intensity were registered in a two-weeks rhythm for each site. Data from forest inventories were analysed for the characterization of tree populations in the Reserva La Ceiba (dry forest) and Estación Científica San Francisco (cloud forest). In La Ceiba 153 of systematically distributed plots with 1000 m² each were established to study all tree vegetation with DBH > 5 cm. In San Francisco eight lines transects were installed in four microcatchments of 8 to 20 hectares each. For each microcatchment one transects was oriented along the ridge and another one along the creek. The transects were subdivided into subplots of 10 m in width and 20 m in length. Maps of soils, temperature (Plan Hidraulico) and dry months (The Nature Conservancy) have been modified and overlaid using the GIS programme Arc View. Besides the vulnerability and danger of extinction of species the main criteria for including species in genetic resource conservation programs are their present and their possible future use (Graudal et al. 1997). Based on the timber market survey of Leischner and Bussmann (2002) we did a selection of priority species. The selected species are of high ecological value and economic importance not only for local use. The above-mentioned study refers to the wood market of the Province's Capital Loja and consists mainly of species from the lowlands of Zamora Chinchipe. Woods from the Province of Loja are very scarce due to high deforestation. Because of the necessity of well adapted species to the site conditions of the reforestation trials at an altitude of 2100 m close to Estación Científica San Francisco we modified the list and included species with either economic value (for example Prumnopitys montana, Cedrela montana, Tabebuia chrysantha) or known ecological characteristics like Clethra revoluta (pioneer), Myrica pubescens, Alnus acuminata (pioneer, nitrogen fixation), endangered species (Prumnopitys montana, Podocarpus oleifolius, Cinchona pubescens) among others. We are aware about the high intrinsic value of other tree species in the mountain forest ecosystems of Southern Ecuador, which cannot be covered by our project. Genetic variation in forest genetic resources is expressed in differences between species, populations, individuals and chromosomes. High levels of intraspecific genetic variation, which is needed to ensure the adaptability of the species as well as their continuing evolution, characterize many tree species. It is well known that the ecological conditions in the Andes vary noticeably between the eastern and western slope of the cordillera as well as a matter of altitudinal zonation, mesoclimatic differences, or local climate systems. The variety of ecological conditions within the natural distribution area of a species, e.g. Cedrela spec. supports the hypothesis of genetic differentiation between populations of the same species as a result of adaptation to the varying local conditions. Because of the separation of the populations by high elevation mountain borderlines gene flow via pollen and seed between these populations is very limited. Habitat heterogeneity, combined with natural selection, often results in multiple genetically distinct ecotypes within an single species (Hufford & Mazer 2003). In a second step we started with phenological investigations (e.g. dates of flowering and fruit ripening) of four different tree species (Cedrela montana, Prumnopitys montana, Myrica pubescens, and Clethra revoluta) in two different areas of South Ecuador. 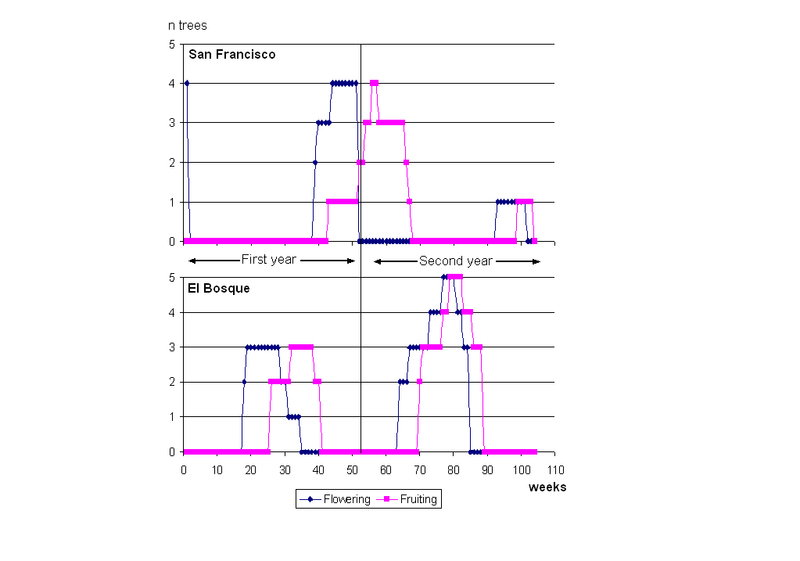 (Figure 1) indicates the variation of flowering and fruiting of Cedrela montana in San Francisco during a two years period of observation. It is notable that the minimum of variation coincides with the culmination of the phenological phenomena. During the initial and the terminal phase one can see the maximum of variation. Even the lowest values of variation reach 56,7 % (flowering) and 77,4 % (fruiting). Practically this means that one can find fruiting and non-fruiting neighboring trees at the same time. The further species under observation show even higher values of variation [[Table 1]]. Fruiting is more variable than flowering, and the variation in San Francisco in general is much higher than in El Bosque. This could be explained by climatological features, i.e. more distinct dry and wet seasons in El Bosque, and indicates possibly an adaption of species to certain ecological conditions of each site. The differences in phenology of Clethra revoluta between the two study areas are enormous. The beginning of flowering and fruiting in El Bosque starts about half a year earlier than in San Francisco. It is notable that both sites show a seasonal rhythm of phenological characteristics, although especially San Francisco area is considered as a perhumid site with very low fluctuation of climatic parameters. There are not only differences in the rhythm but also in the intensity of flowering and fruiting. Though a decline in flowering and fruiting was observed in the second year in San Francisco, an increase was registered in El Bosque. Similar differences in phenological phenomena were present in the other species, too. In general flowering and fruiting start earlier in El Bosque. Myrica pubescens had almost no seasonal rhythm in San Francisco, but a slight seasonality in El Bosque. This could indicate a more distinct seasonality of dry and rain season in El Bosque in comparison with San Francisco. Figure 1. 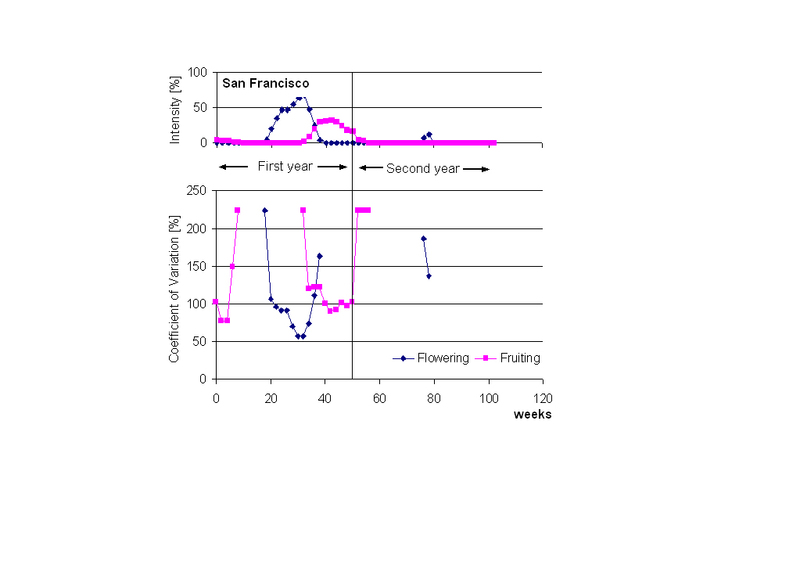 Intensity and Variation of Phenology of Cedrela montana in Estación Científica San Francisco in two years of observation. Figura 1. Intensidad y variacion fenologica de Cedrela montana en la Estación Científica San Francisco an dos años de observacion. Table 1. Minimum Coefficient of Variation of Flowering and Fruiting Intensity during two years of observation. Tabla 1. Coeficiente minimo de variacion de intensidad de floracion y frutificacion durante dos años de observacion. In (Figure 3) and (Figure 4) we show the distribution of Prumnopitys montana and Cedrela montana in four watersheds of the San Francisco area. 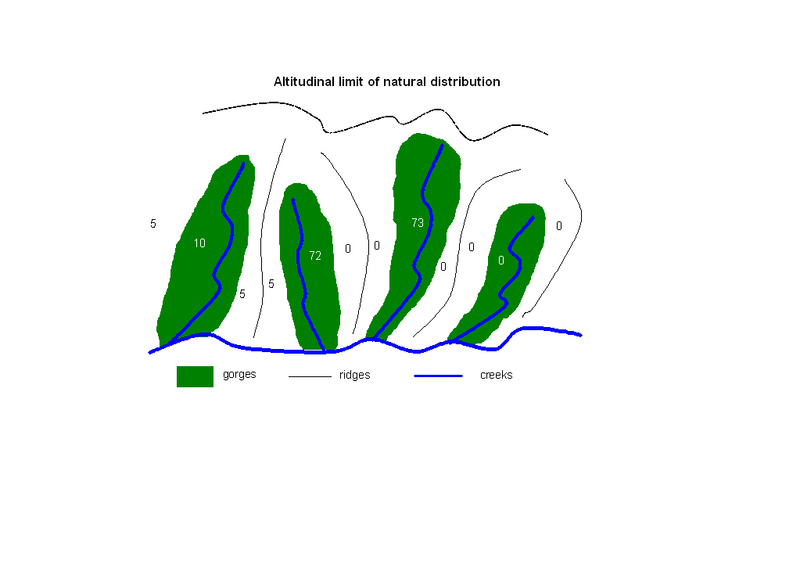 We identified three clusters of Prumnopitys montana and four of Cedrela montana, each cluster in gorges and separated from each other by pronounced ridges. Prumnopitys montana is a dioecious species and an unbalanced female-to-male ratio in subpopulations can cause malfunction of the reproductive system. On the other hand insects make pollination efficient and facilitate recombination. Under these marked topographical structures it is questionable whether gene flow between subpopulations of Cedrela montana via pollination by wind is efficient as well. Nevertheless the monoecy of Cedrela may compensate for this difficulty. The subpopulations of Prumnopitys montana and Cedrela montana within the gorges pass the critical size for static conservation of 50 defined by Graudal et al. (1997) but dynamic conservation only can be guaranteed when there is gene flow between the subpopulations. Figure 2. Differences of flowering and fruiting of Clethra revoluta between the study areas San Francisco and El Bosque. Figura 2. Diferencias en floracion y frutificacion de Clethra revoluta entre San Francisco y El Bosque. Tabla 2. Numero total de individuos (DBH > 5 cm) de especies raras en la Reserva La Ceiba, con densidad alta entre los clusters de especies. In la Ceiba especially, forage-species for roaming goats and cattle as well as exploited woody species don't regenerate very well (Rivas et al. 2003). The high mean distances between clusters of rare species like Cavanillesia platanifolia, Guazuma ulmifolia or Maclura tinctoria (Table 2) could cause a reduced gene flow between clusters of a single species so that in future the clusters could become isolated and dynamic conservation impeded. Maclura tinctoria is considered as an endangered species for the region of South Ecuador by Cabrera et al. (2002). Figure 3. Model of distribution of subpopulations of Prumnopitys montana (zoochor) with DBH > 10 cm in the 4 studied watersheds of ECSF-forest. Figura 3. Modelo de distribucion de sub-populaciones de Prumnopitys montana (zoochor) con DBH > 10 am en las 4 microquencas del bosque ECSF. Figure 4. Model of distribution of subpopulations of Cedrela montana (anemochor) with DBH > 10 cm in the 4 studied watersheds of ECSF-forest. Figura 3. 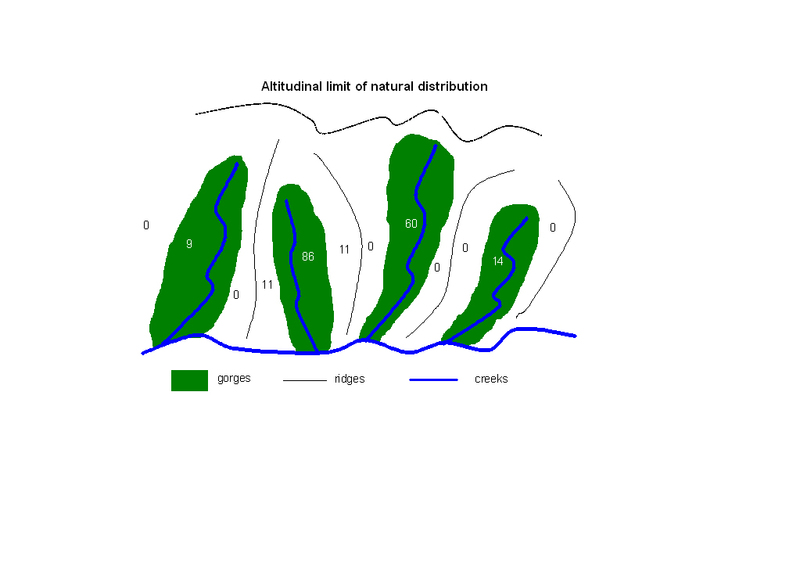 Modelo de distribucion de sub-populaciones de Cedrela montana (anemochor) con DAP > 10 cm en las 4 microcuencas del bosque ECSF. Deforestation in San Francisco valley is mainly caused by conversion of forest into pastures for cattle (Beck, pers. comm.). The remaining subpopulations of Cedrela montana or Prumnopitys montana are at the upper limit of their natural distribution. We argue that these subpopulations located in micro-watersheds become isolated this way because pollen and seeds may hardly be able to overcome the surrounding natural barriers [[Figure 3 and 4]]. Nevertheless further investigation is necessary to proof whether geographical distance and/or natural barriers implicate the development discontinuous genetical variation. Based on these observations we suggest the delineation of so-called "genecological" zones, where the variation of environmental conditions is investigated and uniform zones are formed based on available data. Three ecological parameters (temperature, humidity and soil types) were used for delineation of genecological zones. A very broad range of environmental conditions can be observed in the Province of Loja: The mean temperatures range from 8 to 26 degrees centigrade, the humidity between 0 and 12 humid months, and the provincial watershed management plan has identified eleven major soil types. We defined 4 distinct classes of temperature and 6 classes of humidity. The three ecological maps were overlaid to deduce possible genecological zones. 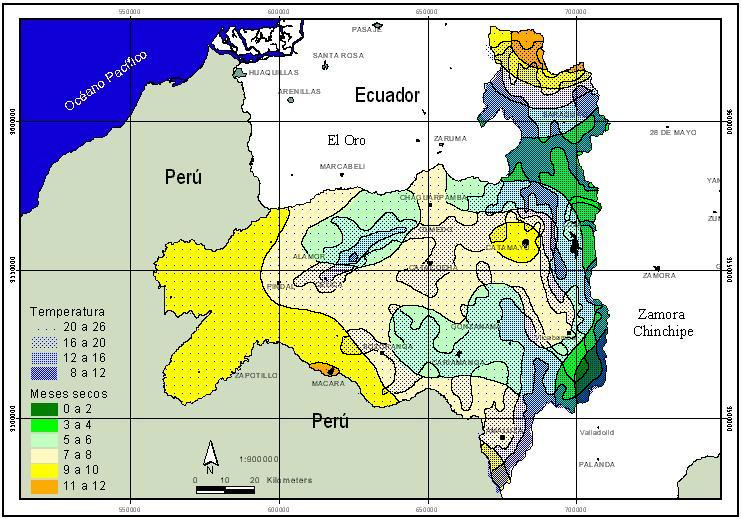 From the 264 theoretically possible zones (11 soils x 4 temperature x 6 humidity) 134 potential genecological zones resulted for the Province of Loja. This very high number derives from the high diversity of environmental conditions. Table 3 indicates the high variability of possible genecological zones in the Province of Loja that results from overlaying the maps of ecological factors. Figura 5. Numero de meses secos en la Provincia de Loja (Datos de Nature Conservancy). Figura 6. Temperatiras promedias en la Provincia de Loja (Datos de Plan Hidraulico). Figura 7. Distribucion de tipos de suelo en la Provincia de Loja (Datos de Plan Hidraulico). Figura 8. Zonacion climatologica de la Provincia de Loja. Figura 9. Zonas genecologicas potenciales para la Provincia de Loja. Table 3. Numero y area de zonas genecologicas de la Provincia de Loja. From [[Table 3]] we can deduce that especially the areas with relatively extreme environmental conditions are heterogeneous in genecological zones, nevertheless that they are relatively small. The perhumid (0-2 dry months) and the very dry zones (11-12 dry months) have promedium sizes of 15 to 19 km respectively, the cool (8-12 °C) and hot (20-26 °C) zones have sizes between 63 and 30 km. Maldonado (2002) remarks that the high heterogeneity of climatic conditions is related to the orografically variability. Table 4. Size frequency of genecological zones. Tabla 4. Frequencia y tamaño de zonas genecologicas. 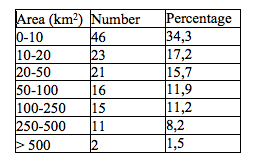 Many of the potential genecological zones in the Province of Loja are very small [[Table 5]]. There are more than 90 zones smaller than La Reserva La Ceiba, which corresponds to a 67,2 % of all. Many of Loja's forests are of a similar or even higher tree diversity than La Reserva La Ceiba so that pollination distances between conspecifics are commonly high and human pressure, especially selective logging, exploitation or silvipasture of goats and cows counteract dynamic conservation by their detrimental effects, namely through reproductive isolation of subpopulations and individuals and prevention of gene flow. Management of seeds in those areas could become very difficult because high efforts are necessary to identify the potential seed trees. Therefore it is necessary to delineate major seed zones on basis of a further map that includes vegetation cover, distribution of target species and barriers for gene flow. Table 5. Number of genecological zones within certain protection categories in the Province of Loja. Tabla 5. Numero d ezonas genecologicas con categories de proteccion en la Provincia de Loja. [[Table 5]] shows that only a very low percentage of all potential genecological zones in Loja are represented in the SNAP-system of conservation areas (12,7%). Lower protection categories cannot provide the effectiveness of National Parks and sometimes-even National Parks suffer from human pressure. Hence it must be concluded that the variety of genecological zones in the Province of Loja are highly endangered. It is notable that especially in the very dry areas of Loja only a very low percentage of genecological zones is represented in any category of protection. Also in the cool parts (corresponding to high altitudes) only 50 % of all genecological zones are protected, although this ecozone is relatively well covered by the Podocarpus National Park. Table 6. Number of genecological zones without any protection status in the Province of Loja. Tabla 6. Numero de zones genecologicas sin ningun estado de proteccion en la Provincia de Loja. The continuous supply of high quality tree seed for planting activities (reforestation, plantation establishment) requires the establishment of normative and production standards. After formulating national policies and standards, the national and provincial governments provide legal standards and regulations for good practice (e.g. mechanisms to influence and monitor the use of reproductive material). A first attempt could be the proposal "ley para la conservación y uso sustentable de la biodiversidad", but further more detailed regulations are needed. Within these regulations, the approval and monitoring of seed sources of priority species, but also the revision of seed sources, is one of the basic steps, which will be accomplished by seed certification and control/monitoring of seed procurement. Target groups for tree seed programmes are farmers and communities in rural areas using and planting trees for a multitude of purposes, but are also enterprises or agencies often undertaking afforestation on a larger scale (Graudal 1998). The build-up of a network of seed production stands is seen as a prerequisite of the professionalisation of seed production. This includes the establishment and management of conservation stands. During the initial years the establishment of a working system (including research and development in seed procurement) and infrastructure as well as the marketing of seeds may require subsidizing by the government. Types of tree seed suppliers can be either public sector (e.g. government directed) or private (NGOs, communities, farmers etc.). Ways of non-commercial distribution, dissemination and diffusion of seed should be found and encouraged to promote the programme. Herein the private sector will act as a seed supplier as well as a seed user, e.g. through the domestication of trees on farms. From the organisational point of view the establishment of tree seed centres (governmental or private) is of utmost importance. These centres are in charge of the implementation of tree seed programmes through the development of long term and annual plans for seed supply and the development of additional seed sources. We are hopeful that a well established and organized tree seed programme can counteract and minimize the uncontrolled and undocumented movement of forest germplasm, including exotic species, for plantation establishment, which is leading to the loss of locally well adapted populations of native species. We thank Fabian Rodas for the help with GIS, Manuel Cabrera, Maria Luisa Diaz, Manuel Lojan & Eduardo Ordoñez for the observation of phenology, Cesar Caraguay and René Rivas for the fieldwork in La Ceiba and the crew of Herbario de Loja for the fieldwork in ECSF area. The German Research Foundation (DFG) funded the project. Logistic help came from the Foundation Nature and Culture International. The project was funded by the German Research Foundation (DFG). Cabrera C., O.; M.Z. Aguirre; C.W. Quizhpe & R. Alvarado. 2002. 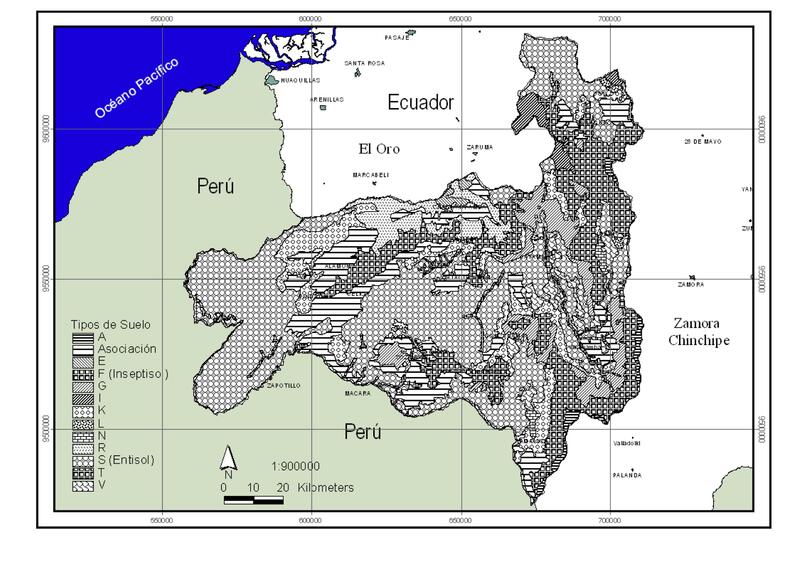 Estado actual y perspectivas de conservación de los bosques secos del sur-occidente ecuatoriano. In: Aguirre, Z.; J.E. Madsen; E. Cotton & H. Balslev (eds.). Botánica Austroecuatoriana. Abya Yala, Quito. FAO, DFSC, IPGRI. 2001. Forest genetic resources conservation and management. Vol. 2: In managed natural forests and protected areas (in situ). International Plant Genetic Resources Institute, Rome, Italy. Gálvez M., J.R., O.R. Ordoñez G. & R.W. Bussmann. 2002. Estructura del bosque montano perturbado y no-perturbado en el Sur de Ecuador. In: Bussmann, R.W. & S. Lange. (eds.) - Conservación de la Biodiversidad en los Andes y la Amazonía - Conservation of Biodiversity in the Andes and the Amazon, p. 195-208. Graudal, L.; E. Kjaer; A. Thomsen & A.B. Larsen. 1997. Planning national programmes for conservation of forest genetic resources. Danida Forest Seed Centre, Humlebaek, Technical Note No. 48, 58pp. Hufford, K.M. & S.J. Mazer. 2003. Plant ecotypes: genetic differentiation in the age of ecological restoration. Trends in Ecology and Evolution 18/3, 147-155. Kjaer, E.D. ; L. Graudal & I. Nathan. 2001: Ex situ conservation of commercial tropical trees: strategies, options and constraints. Presentation given at ITTO international conference on ex situ and in situ conservation of commercial tropical trees. Yogyakarta, Indonesia. June 2001. Leischner, B. & R.W. Bussmann. 2002. Mercado y uso de madera en el Sur de Ecuador. In: Bussmann, R.W. & S. Lange. (eds.) - Conservación de la Biodiversidad en los Andes y la Amazonía - Conservation of Biodiversity in the Andes and the Amazon, p. 651-660. Maldonado A., N.P. 2002. Clima y vegetación de la region sur del Ecuador. In: Aguirre, Z.; J.E. Madsen; E. Cotton & H. Balslev (eds.). Botánica Austroecuatoriana. Abya Yala, Quito. Manel, S. ; M. Schwartz; G. Luikart & P. Taberlet. 2003. Landscape genetics: combining landscape ecology and population genetics. Trends in Ecology and Evolution 18 (4): 189-197. Plan Hidraulico: Mapa de los Suelos de la Provincia de Loja. Plan Hidraulico: Mapa de las Temperaturas en la Provincia de Loja. Rivas, R. ; C. Caraguay & S. Günter. 2003. Estado de Conservación de poblaciones de árboles en la Reserva La Ceiba en el Sur del Ecuador. Presentación en el II Congreso de Conservación de la Biodiversidad de los Andes y la Amazonia. Loja, Ecuador. Sierra, R. 1999. Mapa Vegetación Remanente del Ecuador Continental. Circa 1996. Escala 1:1.000.000. Quito: Proyecto INEFAN/GEF y Wildlife Conservation Society. 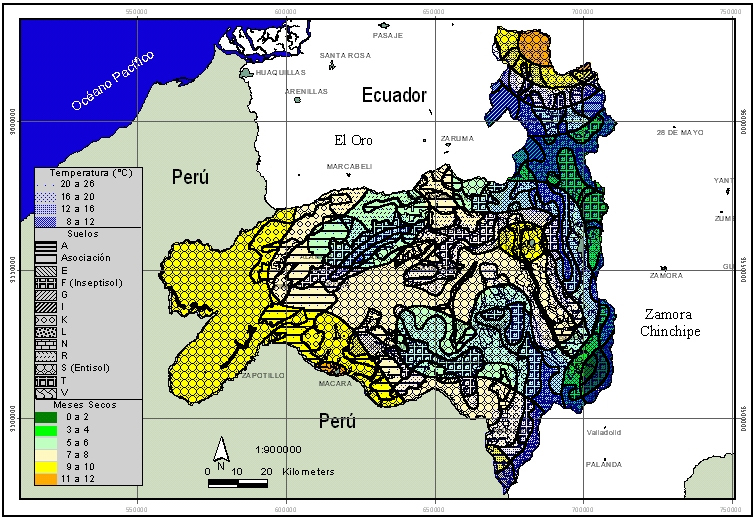 Sierra, R.; Cerón, C.; Palacios, W.; Valencia, R. (1999): Mapa de Vegetación del Ecuador Continental. Escala 1:1.000.000. Quito: Proyecto INEFAN/GEF-BIRF, Wildlife Conservation Society y EcoCiencia. The Nature Conservancy: Mapa de los meses secos en la Provincia de Loja. Young, A.; D. Boshier & T. Boyle (eds.). 2000. Forest Conservation Genetics. Principles and Practice. CSIRO Publishing, Australia. 352 p.